Single-family housing unit authorizations in August were at a rate of 737,000, 3.7 percent above July 2016. 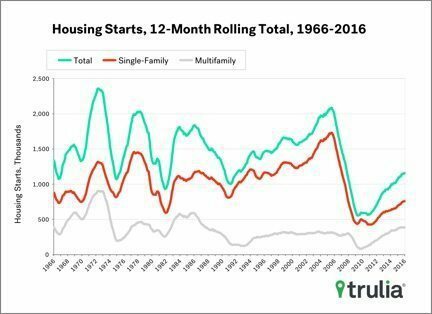 Single-family housing starts in August were at a rate of 722,000, this is 6.0 percent below July. Single-family housing completions in August were at a rate of 752,000; 0.3 percent below July. The market for existing-home sales is underperforming its potential by 5.6 percent. In August, the market potential for existing-home sales grew 1.08 percent month-over-month. Potential existing-home sales increased to 5.78 million, 91.9 percent above the December 2008 market bottom. The index jumped to its highest point since October 2015, rising six points to 65. This is up from a downwardly revised August reading of 59. The index measuring traffic of prospective buyers posted a four-point gain to 48. Home sales increased 5.8 percent year-over-year in August 2016. The median home price was up 5.1 percent year-over-year to $225,900. Inventory in August averaged 3.4 months’ supply — 6 months is considered a balanced market. How far will you go for your listing clients?